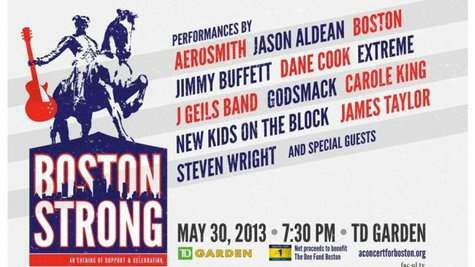 Aerosmith, Boston, Extreme and more are among the artists who will perform at "Boston Strong: An Evening Of Support And Celebration," a benefit concert to be held at the TD Garden on Thursday, May 30. Net ticket proceeds from the historic concert will benefit The One Fund Boston, set up by Massachusetts Governor Deval Patrick and Boston Mayor Thomas Menino to help the people most affected by the tragic events that occurred in Boston on April 15. Tickets for the event will go on sale Monday at 10 a.m. through Ticketmaster for $35 to $285 (including all fees and service charges). In an effort to make sure all net proceeds from ticket sales go directly to The One Fund, all tickets will be sold through Ticketmaster's paperless ticket delivery. Fans must have the credit card used to make the purchase and a valid, government-issued ID to gain entry. "Live Nation and TD Garden have hosted thousands of concerts over the years, but none with such a sense of purpose as 'Boston Strong: A Concert Of Support And Celebration'," said Don Law, President of Live Nation New England, in a press release. "Boston is a city with strong roots, and homegrown artists reached out to us to see what could be done. We are proud to help solidify this huge concert lineup."